At the February Parks and Rec meeting this year, Elberta Farmers’ Market master Sue Oseland presented a proposal to apply for a $70K USDA grant for permanent, piped restroom facilities at the Penfold/Farmers’ Market park. The restroom would be 10×20 with two separate ADA-compliant family restrooms. The facility would be locked at night and would shut down completely from late October to beginning of May. For many years now the Market and Penfold Park have been served by two porta-potties. The Parks and Rec Commission and the Village Council agreed that permanent facilities would better serve Farmers Market patrons and vendors during the season as well as people who use the Betsie Valley Trail, which has an important junction there at M-22. The Parks & Rec Commission voted to support Sue’s application and voted to kick in another $5K for a drinking fountain if the grant was received. 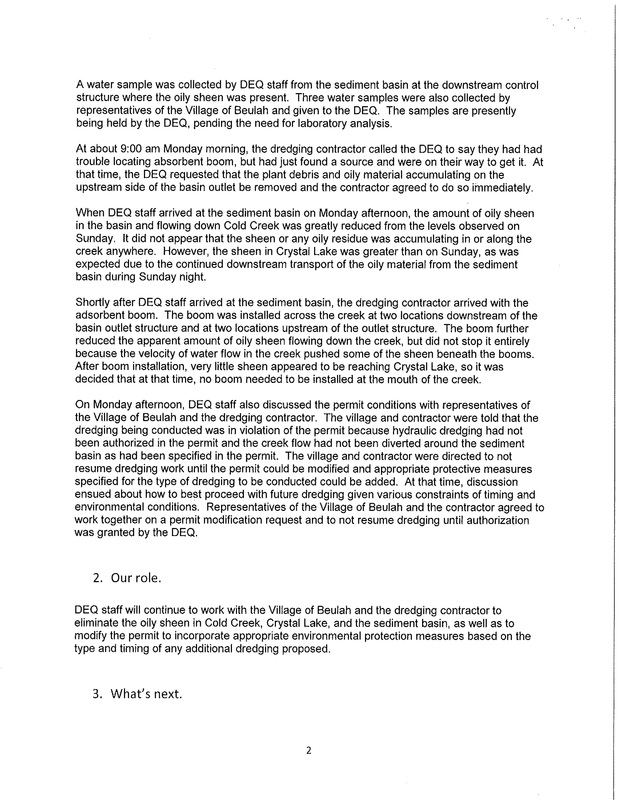 The Village received word June 3 that the USDA had accepted the proposal but due to their own budget constraints are prepared to award only $50K of the original $70K requested. Before making their offer official, USDA needs to know whether the Village would still proceed with the project with this partial funding. The deadline to let them know is June 10. Parks & Rec and the Village Council will hold a special joint meeting June 9 at 6:30 in the Community Building to decide if they can commit to do the project with the lesser funding amount and/or commit Village funds to the project. The Village is still in a deficit situation, despite progress in shaving it down; six years after the Village was placed on watch by the state for fiscal stress, our revised Deficit Elimination Plan has still not yet been accepted by the Treasury Department. Avoiding cost overruns is certainly top of mind for everyone. The Village of Elberta will conduct a Special Meeting on Monday October 27, 2014, at 7:00 p.m. to consider the financial status of the Village including the 2013 – 2014 audit, the amended 2014 – 2015 budget and the state-mandated Debt Elimination Plan (DEP). 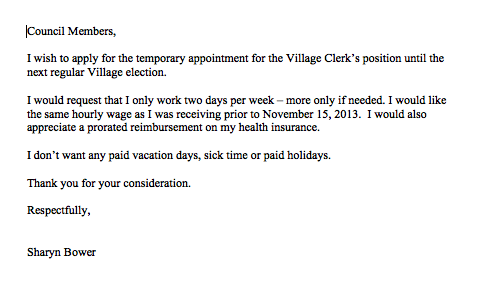 Village Community Building—In a four to three vote during a special meeting tonight, the Village Council decided to hire recently retired Village clerk Sharyn Bower back to the clerk’s position at two days a week, minus the benefits she requested in her application letter, received December 6. 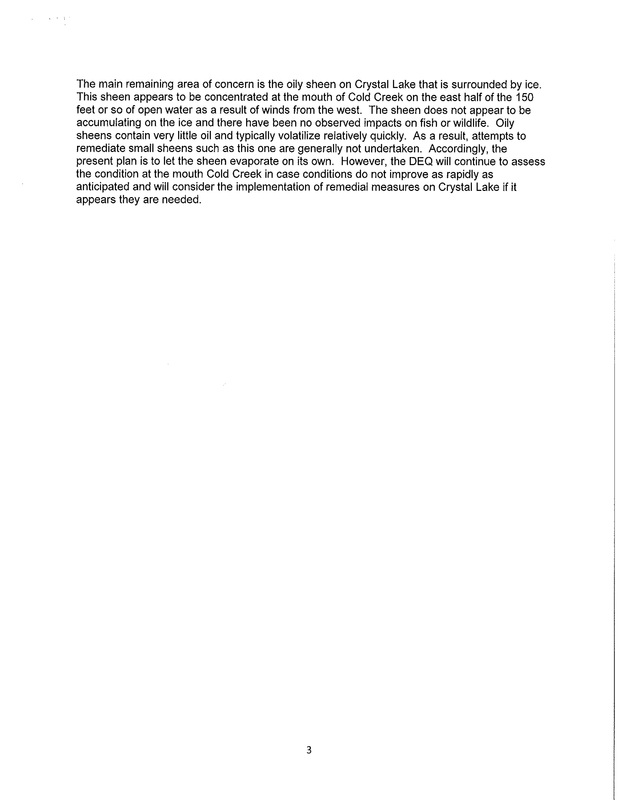 The special meeting notice was posted Monday, December 9, at 11:45 am. Gretchen Eichberger, a resident of Frankfort, had also applied for the job, and postmaster Sue Oseland applied for the job today. 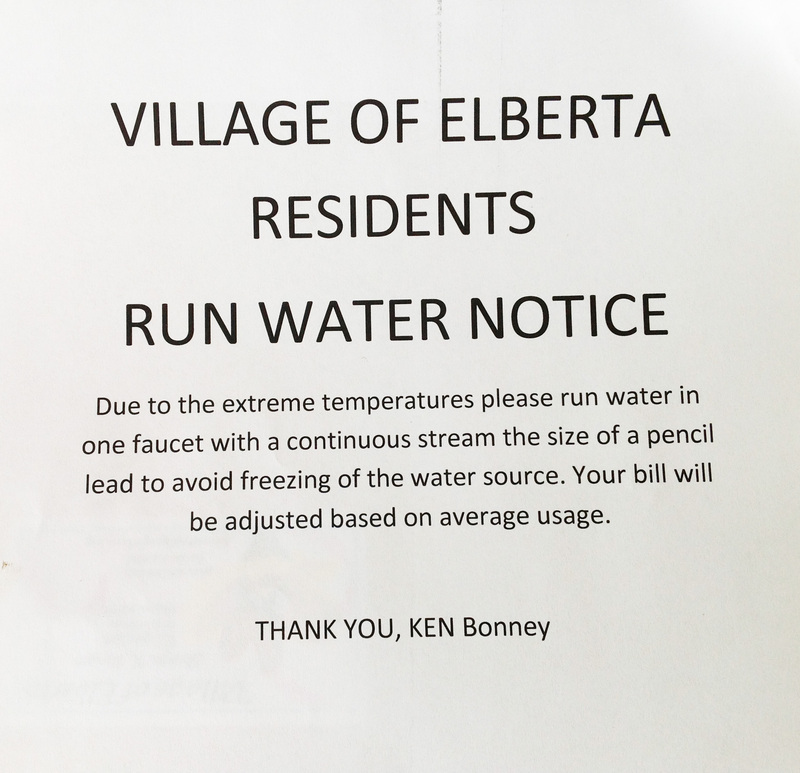 Letter from Sharyn Bower fowarded to council members by email by treasurer Laura Manville. Forwarded to the Alert by Jennifer Wilkins. Several members of the public were in attendance at the meeting on this very cold night: Art Melendez, Emily Votruba, Holly O’Dwyer, Mark Held, Sue Oseland, and Christeen Kibby-Crawford. Sharyn Bower was not present. Laura Manville took minutes. All members of council were present. The vote was Reggie Manville, Ken Holme, Joyce Gatrell, and Robin Rommell for Sharyn’s appointment; Diane Jenks, Linda Manville, and Jennifer Wilkins against. Diane and Linda brought up the fact that the position had not been posted anywhere except Facebook (on the Alert page), whereas the new council member position had been. Reggie said he thought people knew the position was open. He said after the November council meeting he had learned from the Michigan Municipal League that the job did not need to be posted but that it was necessary for the applicant to be a Village resident to be considered. This contrasted with what Treasury department rep Eric Cline had said during the November meeting. Reg said because of this information from MML, he had not contacted anyone in surrounding townships about the job, as had been decided at the last meeting, but had instead decided to wait three weeks and see who applied. Robin asked Sue some questions about her application and whether she would be willing to work just two days per week. Sue said she would. Diane Jenks asked about Sue’s web skills. Sue said she had experience updating business websites, was already updating the Elberta Farmers Market page on the Village site, had experience working with databases. She allowed as how she could not “build” a database or a website from scratch. Sharyn Bower at the time of her retirement was having Emily Votruba upload minutes to the Village website on a volunteer basis. Jennifer Wilkins and Diane Jenks expressed concern that Sharyn had begun missing days of work before she formally retired and had written in her retirement letter that the job had become too stressful for her health. They said that with the upcoming deadlines (the Deficit Reduction Plan deadline, December 5, already passed) for deficit reduction and policies and procedures, the clerk job would likely only get more stressful. Ken Holmes and Robin Rommell said they thought Sharyn’s 18 years of experience qualified her to return to the position. Diane mentioned that a part-time hire wouldn’t normally receive any benefits; Sharyn had requested “a prorated reimbursement on my health insurance.” Robin asked to remove her motion that Sharyn be appointed and made a motion to appoint Sharyn to the position at two 8 hour days a week, $16.96/hr, without the health insurance payment as part of the compensation. The motion passed. Hey, everyone. Well, last night was fun. With the help of social media, roving volunteer poll reporters, friendly poll workers, and our tech-savvy friend Aubrey Ann Parker, we were able to bring you election results for several districts in real time over Facebook. Next time we hope to have immediate reporting from all townships (if you’d like to volunteer to report numbers from your district in the future, contact elberta.alert@gmail.com). Aubrey then created this handy-dandy chart with a breakdown of the results by township, including voter turnout for each district. Pretty cool, eh? We’re in the process of collecting more data and creating some other ways to show demographic and political correlations over time. Stay tuned! This thumbelinesque bibliothèque means Elberta is no longer without a library. “As a librarian, it pained me every day to think that people in and around the village did not have easy, free access to books,” says Michele Cannaert, proprietress of the Conundrum Café. She says she’ll add new books if the inventory wanes. When the official Little Free Library charter sign arrives, our library will be posted in the LFL website. For more information go to: http://littlefreelibrary.org/. Thanks for this great addition to the Village, Michele! 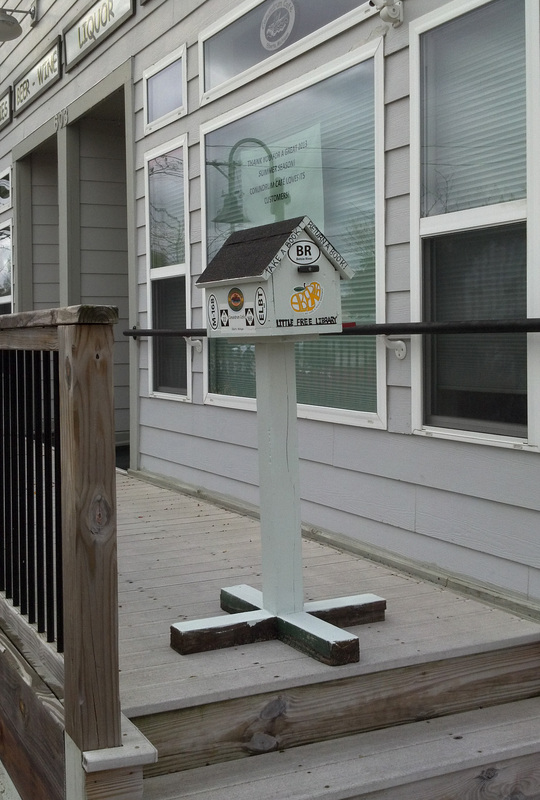 Little Free Library on the Conundrum porch, November 2013. Conundrum Cafe will be open to Trick or Treaters of all ages on October 31 from 6 pm to 8 pm. It’s their way of saying “thanks” to the community! Free treats for all. Ain’t that sweet?